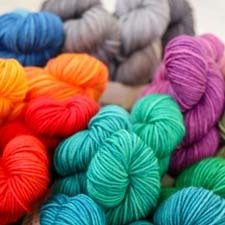 WEBS Yarn Store Blog » 31 Days to Get Organized: Wrap Up! 31 Days to Get Organized: Wrap Up! Wow! What a crazy 31 days of organizing we’ve had. Thanks everyone for following along. I hope you’ve found some of our tips helpful. Also thanks to everyone who left a tip or question in the comments during this series. It helped me to cover some of the organizational issues you’ve been struggling with. And many of you had really useful and creative organizational tips to share. I’ve compiled a list below of the 31 organizing tasks and tips with quick links to each post. Some of you didn’t have time to join in on the organizing last month. Bookmark the list in your browser or your knitting & crochet Pinterest boards so it’ll be easy to find later when you want to tackle your knitting and crochet organization. Also if your organization falls apart over time, this will be a good list to go through each January to whip things back into shape. Day 6: Flash Your Stash! I’d love to get some feedback from you. Either share the tip you found most useful from the organizing series, or ask any organizational question you didn’t get answered. Thanks again everyone for following along. This has been a ton of fun. This entry was posted on Friday, February 1st, 2013 at 12:35 pm	and is filed under Tips & Techniques. You can follow any responses to this entry through the RSS 2.0 feed. You can skip to the end and leave a response. Pinging is currently not allowed. Such wonderful information! I sat in my “knit room” for a couple of Sundays and input my books into Raverly as well as my stash. Now I go into my stash online and search for projects on Raverly – especially for my 1 or 2 ball supplies. I love knitting quick cowls with interesting patterns! Thank you for publishing this information. It was/is very helpful. Thanks for the 31 days of organization! I read every one, and just last night I put them all on my Pinterest board so that I’d have a place to review them as I attempt to get my yarn/craft room organized. Great series! Thanks for doing this. I’ve enjoyed the articles, although I am a long way from organized. I hope the tips will stay on the blog, so I can refer to them as I have time and energy. This was a great series! Thank you for putting all the links together in one space so I can bookmark it.